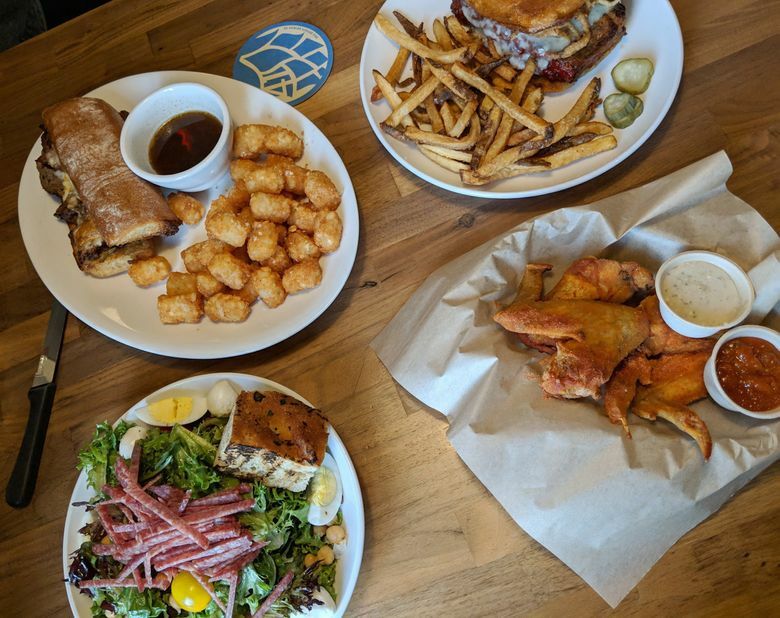 It sits on the same stretch of 14th Avenue that is puffing up with plenty of lip-smacking options — the adorable, pocket-size Left Bank wine bar opened in fall 2017, while former Lloyd Martin chef Sam Crannell opened South Town Pie in early 2018. Uncle Eddie’s occupies a spot on the corner of 14th Avenue and South Cloverdale Street. The moody space is wrapped with windows, the remaining walls dotted with quirky vintage finds, ceramic Wild Turkey bottles, framed pinball glass art and the odd beer sign. The bar itself is topped with thousands of pennies trapped underneath an ocean of epoxy. There’s a small patio out back complete with umbrellas and a few strings of bistro lights. It’s not a dive bar, but it’s got the warmth and ease one seeks in a neighborhood joint. Yes, there are huge grilled sandwiches on the menu, stuffed with pulled pork or flank steak, chicken chile verde, egg salad and even a slab of meatloaf — as well as typical pub fare: wings, pickled eggs, totchos (tater-tot nachos for the uninitiated), and requisite fried things such as mac-and-cheese balls and garbanzo fritters. Rounding things out are soups and a few salads. Fries are hand-cut, salad dressings are made fresh in-house and buns are sourced from Grand Central Bakery. Weekend brunch is focused on house-made biscuits topped with either gravy, berries and cream, or hollandaise. The drink side of things is short and sweet; a handful of local tap beers, classic cocktails and wine. Also, “beer and a bump” specials: special pricing on PBR, Rainier or Tecate tall boys paired with a shot. I love a menu that makes you want surprising things. Take the meatloaf sandwich ($15). I’ve never been a meatloaf person. My mom never made it when I was a kid, and I never make it for my family. 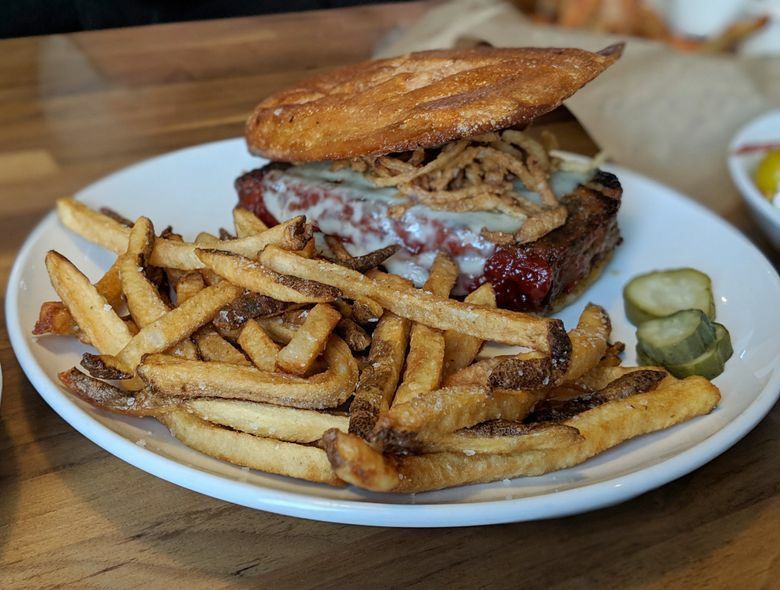 Here, the sandwich has an innocent list of ingredients: beef and pork meatloaf with Swiss cheese, buttermilk-soaked fried onions and horseradish aioli. But something about that just made me want it. Let me say this: That meatloaf is a wonder. There is no burger on the menu — this is the closest thing to it — but it will satisfy any burger-like craving. It’s a veritable slab of meat, with just the right amount of sticky, sweet ketchup-y sauce adhered to one side. 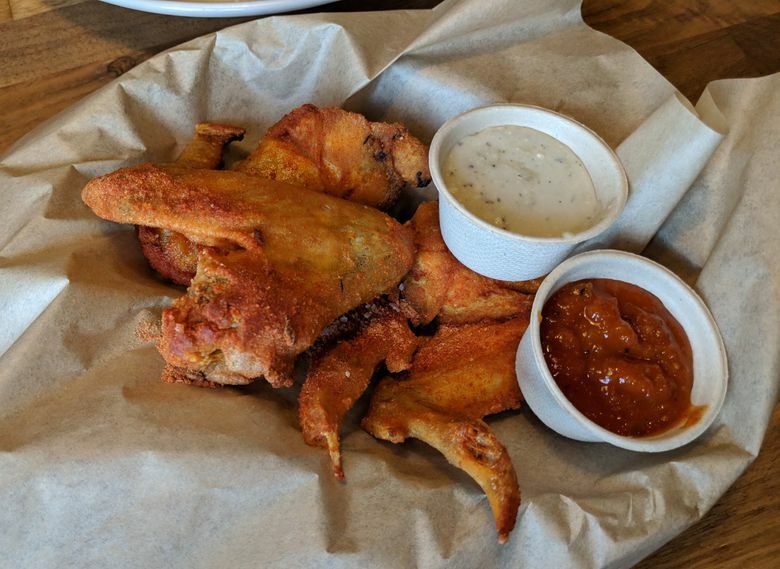 It’s moist and crumbly, and the horseradish aioli and crispy, greasy little fried onions make each bite darn near perfect. 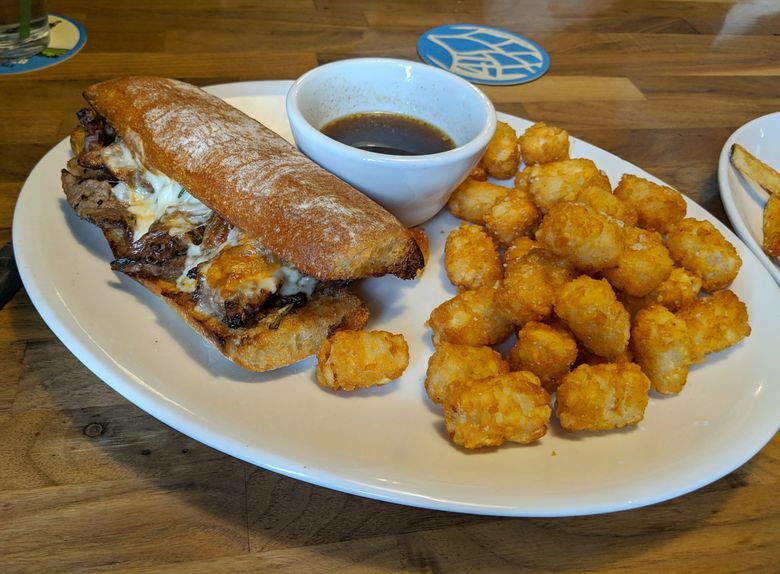 Additionally, the Seattle Cheese Steak ($15) topped with chewy little morsels of flank steak, caramelized onions and a generous schmear of garlic aioli (and that all-important side of au jus) is also quite delightful. The crispy tots ($5) are indeed wonderfully crisp, and the fries have that pleasing greasy, salty flop that the best hand-cut, skin-on fries do. The best part of the chop chop salad ($10) is the sherry vinaigrette and the mixed greens, which was actually a nice mix of crunchy red and green leaf, frisee and arugula. 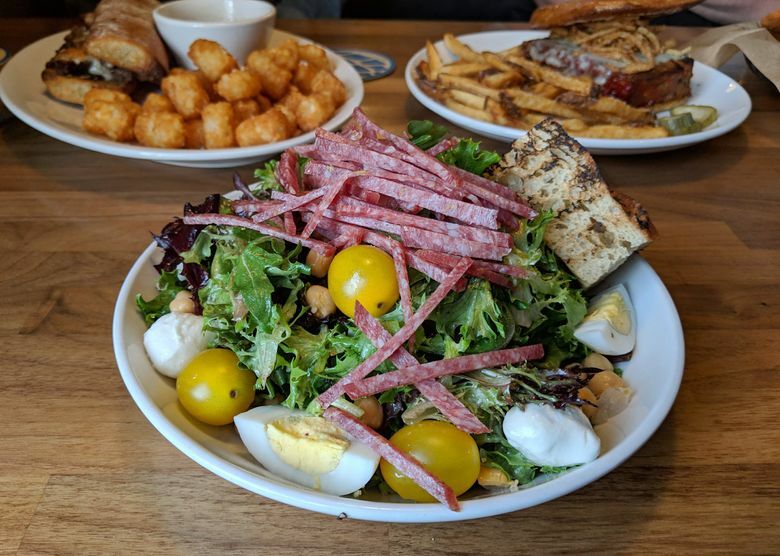 I can’t believe I’m about to complain about too much salami — but there, indeed, was a little too much salami, coupled with chalky hard-boiled eggs. I’m always appreciative of a whole wing, and although the chicken wings (three for $6/five for $9) were nice and crispy — the dry rub was incredibly heavy handed and strangely bitter. Buffalo-style was on special the night I was there, and perhaps that would’ve been a more prudent route to go. Overall, if you’re close to Uncle Eddie’s and you’re looking for your new go-to neighborhood spot, definitely get in there and grab a meatloaf sandwich.